"Now for full disclosure, sometimes I do not make the noble choice . . . [and] I know when I fail to expend the energy needed to make a conscious decision that it takes a toll on my relationship. Here's where this book becomes a gift. Because once we understand the natural laws of sustaining love, we can take control of our actions instead of flailing about, helpless in the face of our basest emotions or leftover childhood trauma. With each choice, we can thoughtfully clear the way for a lifetime of love." 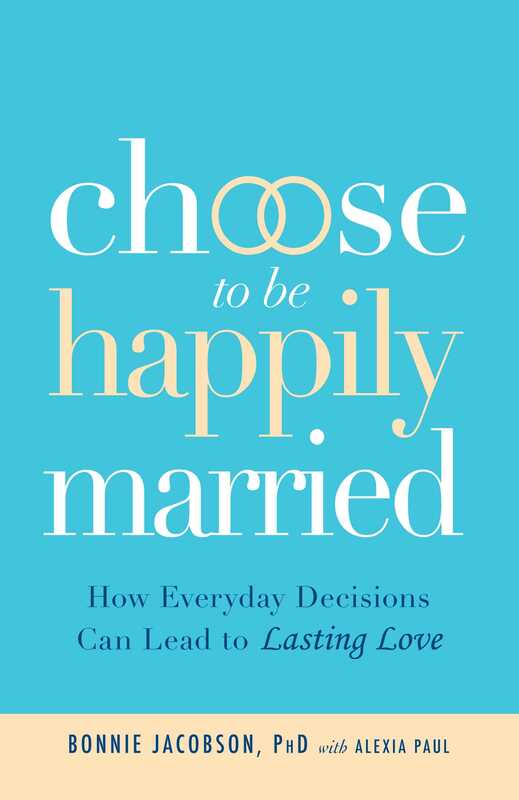 Dr. Bonnie Jacobson, author and psychologist of nearly forty years, knows that no couple is perfect and in Choose to Be Happily Married, this is the first and foremost truth. The second is that every couple has the ability to experience true and lasting happiness, within that imperfectreal lifelove. Structured around twenty-five everyday Turning Points, with anecdotal case studies supporting each one, this unique couples' therapy tool inspires and informs readers better than any costly session with a marriage counselor could.